SAFFAscapes: How LOW can you go??? Everybody who knows anything remotely significant about wildlife and bird photography will tell you how important it is to get eye contact with your subject. In a previous post I expanded on why and when I think there are times when you can break this "rule"...but in most cases the saying rings true. I want to add to this: eye-contact at the subject's eye level is just as important! The problem we often have to face, whether we are on a self-drive safari or on a game-viewing vehicle on a guided safari, is that we are just too high to get a real meaningful perspective on smaller subjects. Placing the photo on the subject's eye level adds a lot of impact, poignancy and "relevance" to a photograph...it allows the viewer to really connect with your subject. Because, let's be honest, many photos out there look like they could have been taken in any zoo or animal compound because of the "unnaturally" high angle of the shot. Like I said above, this is not always possible (you wouldn't want to get out and lie down in front of a close approaching lion now would you? )...but when it is at all possible to do so safely and without causing undue distress to the animal or bird...try it! I'll give you a quick example. 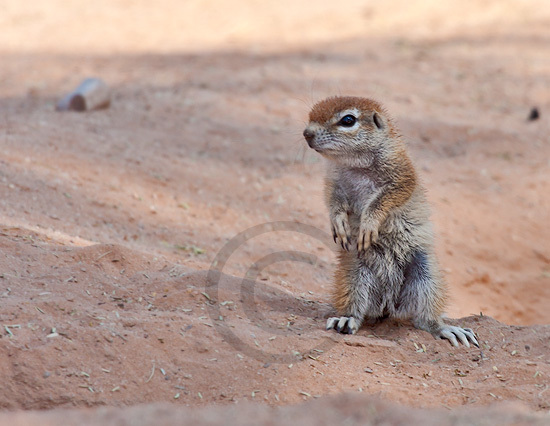 Below are 2 photos I captured of ground squirrels in the Kgalagadi Transfrontier Park (albeit not on the same trip). The first one was a very cute baby which I had to snap from the car window at an angle that is not a deal-breaker, but less-than-ideal in any case. 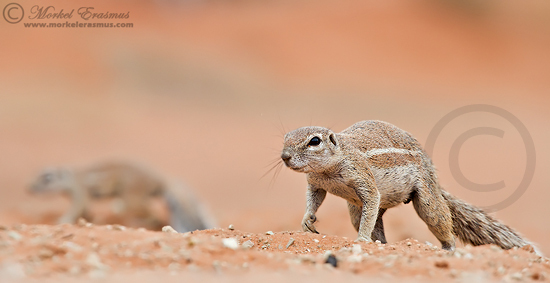 In the next photo I was in the Twee Rivieren rest camp in the Kgalagadi Transfrontier Park lying flat on my stomach to photograph these ground squirrels who were busy scrounging for a morsel in the unforgiving Kalahari sands. The lower angle really makes a big difference in placing the viewer in the scene, even though the mathematical difference in viewing "angle" here is probably not that much. Many times the topography of the land will actually assist you in getting that ideal angle without you having to go through the extra effort! A case in point: observe the pictures of the following 2 lions. I digress they were photographed in completely different settings, but alas, this is to illustrate the point. 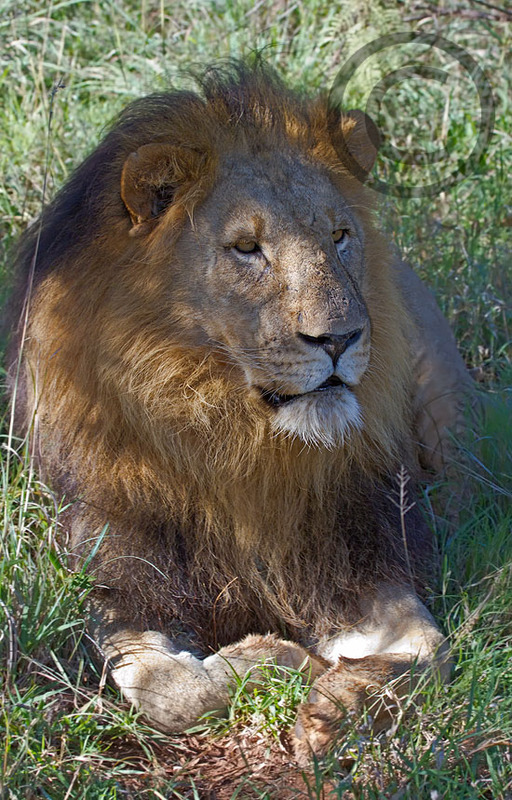 This large male was photographed in the Madikwe Game Reserve from a game-viewing vehicle. Most of you who've been on safari in Africa will have a similar shot. It's stock standard. The light wasn't ideal, so I used a bit of flash. 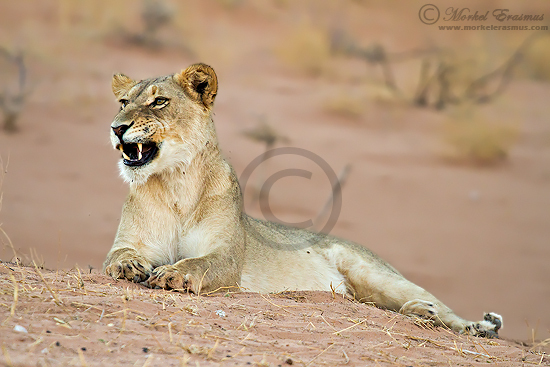 The 2nd lion was a lioness we spent some time with in the Kgalagadi Transfrontier Park. She and the rest of her pride were just waking up at dusk after their afternoon nap and were getting ready for the night's hunting. She was lying on an incline of a dune, which made a very unique angle possible, even from the window of the SUV we were driving at the time. Also notice how just going that little bit lower helps to separate your subject from the sometimes distracting background just a bit more. I hope this post has at least inspired you to try getting down low more often! I am leaving early next week for a wonderful safari to the Savute and Okavango Delta regions of Botswana...and I am very excited! So, until I return with more wonderful stories, photos and tips from the bush - keep well and keep clicking!